I can't believe I've forgotten to mention this until now. A lot of people who write to me ask about resources for more folks to whom they can write. While it is NOT a pen pal service at all, if you're looking to write a letter that might make a real difference, I highly recommend Anysoldier.com. It is a direct way to get requests and addresses from real U.S. Military service personnel stationed overseas. In a nutshell, it's no longer legal to address a letter to "any soldier," for security reasons. The soldiers (marines, airmen, sailors, etc) who participate in the Any Soldier program consent to serve as a contact for their unit or company (I don't know military terminology, so forgive me if I mangle some of it). The contact solider provides updates on the address - they're almost always at a base or an FPO or something like that - and these addresses do change frequently so you want to make sure that if you request an address, you use it immediately. There is little or no registration involved, you just do a search on their site and then request the address. Someone is sure to correct me if there is more of a registration process - I've been doing it for a while now so it's easy for me and I forget. "There is not one thing on this site, or anywhere, that requires you to send stuff. Letters are THE MOST requested thing by these Soldiers. So, all you need do is send a normal letter in a normal envelope with a normal stamp. If your letter is for a Soldier other then the contact you address it to, PLEASE start your letter "Dear Soldier" not "Dear SGT Smith" as on the address. The contact passes the mail out to folks around him or her and when that servicemember opens the letter it will feel better without the contact's name on it." Don't expect anyone to write back. I've written an awful lot of letters to soldiers, and you do it just because you want to write a letter and make someone's day. Just tell them you appreciate their service to our country. Honestly it may end up being a whole lot more meaningful to the recipient than if you write one of your pen pals anyway. So, if you're looking for an outlet, just to send something, then consider Anysoldier.com while you're considering cruising Sendsomething.net. I should also note that while most soldiers don't write back, quite a few of them do. With two or three I continued a correspondence for a while. For those that did write back, they were so sweet and grateful. And for those of us that are living comfortably stateside, it's really interesting and important to hear about keeping sand out of your tent in 110-degree heat. Or other such details I learned in these letters. Whatever your position on the war - and I'll say here that in most cases I'm a pacifist, but that doesn't mean I'm not thankful for the work our military service personnel do - it has nothing to do with a letter to a soldier, far away from home, thanking them for their work and dedication. I don't think I'm being terribly articulate in this post - and hey, it's pretty darn late at night right now - but I'm not trying to make the point how great you'll feel when you write to a solider. It's thinking about how maybe you'll really brighten their day. Oh, and all of these military addresses and FPOs, although they may be located in Iraq and Afghanistan, only require one 44-cent first class stamp. And if the soldiers write you back, it's free for them. Cool. Update: I just requested an address and wrote a letter. You don't need a password or anything, you just have to give your name and address and agree to the TOS. So I updated this post with photos of what I just wrote. 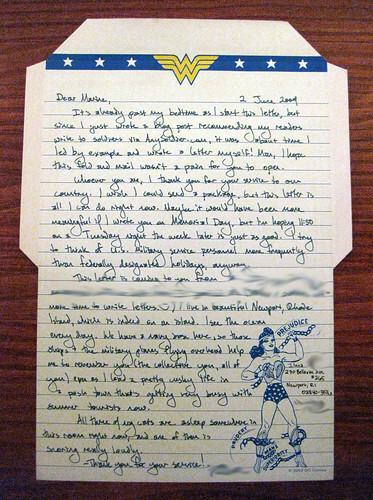 The Wonder Woman fold and mail from Chronicle Books is shown folded at the top, and here is most of what I wrote to an anonymous marine (I did blur out a little bit of personal info in there, you gotta keep a few secrets, y'know?). Sorry the photo is a lot more grainy than my usual fare - but I don't usually take photos of letters at night. Thanks for letting us all know about this! I've been thinking lately about writing soldiers letters but I haven't found a good way to do it yet. I'm happy to have put this out there, Stephanie. I spent a lot of time last summer searching for a good way to write to soldiers, and I found AnySoldier.com by far the best. Thanks for the detailed info! I appreciate it. Oh wow, that is a GREAT resource! I was actually considering sending some books, but thought they'd be so heavy I couldn't manage it. This would make it affordable. There's a Fountain Pen Show? Wow. I wouldn't have imagined! There is so much for me to learn about fountain pens. 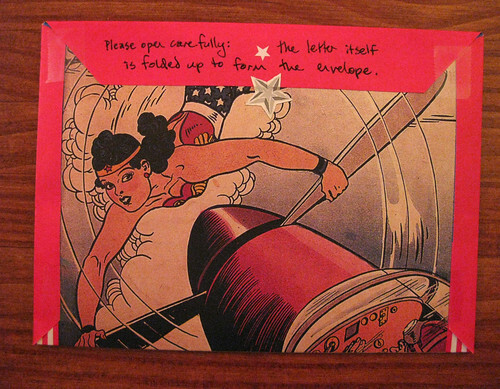 Also, I learned recently about a stationery show in NYC. Why can't it be a little more widespread though? Like why aren't there stationery shops? Geez. Yep, there are pen shows (which specialize in fountain pens, kinda) in some major cities annually. It's awesome! I think the stationery show in NYC was more of an industry insider thing for producers and dealers, but I dunno, I've never been. That would be SERIOUSLY DANGEROUS for me to attend! Let's continue to spread this letter-writing revolution. If we recruit enough letter-writers, maybe we can make stationery shops marketable again. It's a big task, folks, but I think we're up for the challenge. I have a little tiny Edward Gorey Dracula address book. I love it. It's quite portable, but also I write a few addresses in my letter journal, which is small enough to travel with me. It's a nice way to be in the habit of carrying addresses on the go.